The Achelous River is one of Greece’s longest and most important rivers. The Achelous River flows from the elevated slopes of Lakmos Mountain, and travels 137 miles until it empties into the Ionian Sea. The route of the river takes it along the historical border between Acarnania and Aetolia, through gorges and channels that display its power and strength. This power and strength were evident in antiquity as well, and as a result, it had its own strong god associated with it, the Potamoi (River God) Achelous. As a Potamoi, Achelous was regarded as a son of the Titan deities Oceanus and Tethys; Tethys having been said to have given birth to 3000 Potamoi, just as she was also mother to the 3000 Oceanid water nymphs. Achelous was depicted in several different forms, and was thought to be able to metamorphose instantly between all forms, and Achelous might be seen as a merman, a bull or a water serpent. The river Achelous was often referred to as a second Nile in antiquity, and the power and strength of the god associated with the river, would see Achelous named as the leader of all the Potamoi. Today, the most famous story about Achelous is the encounter between the river god and the Greek hero Heracles. Both Achelous and Heracles were suitors of Deianira, the Calydon princess; and although Deianira preferred to marry Heracles, a contest of strength was called for between demi-god and Potamoi. Achelous and Heracles were actually evenly matched strength wise, and to try and gain an advantage, Achelous resorted to changing physical form whenever Heracles grabbed hold of him. Ultimately though, it mattered not whether Achlous was serpent, bull or man, for Heracles would prevail pinning his opponent down, to emerge victorious. The fight between Heracles and Achelous has given rise to a secondary myth about the creation of the Cornucopia, the Horn of Plenty. 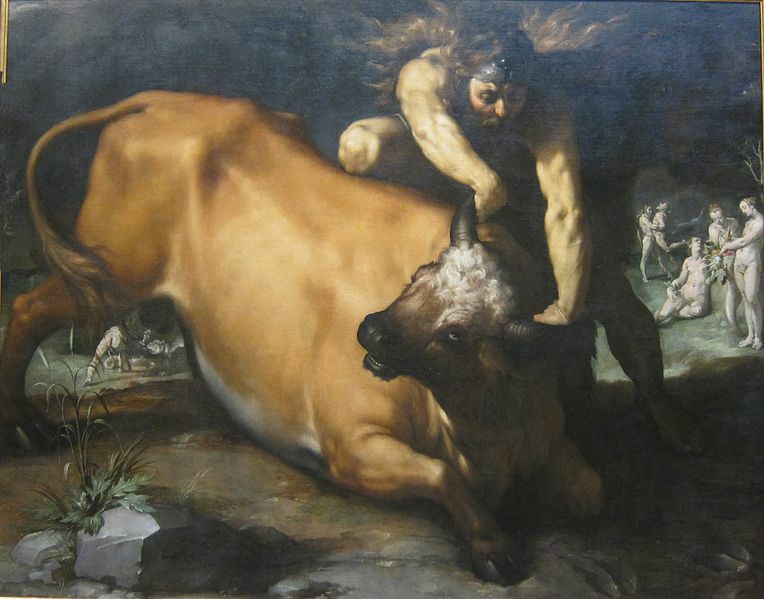 For it was said Heracles broke one of the Potamoi’s horns off when Achelous was in the form of a bull, and subsequently nymphs transformed the horn into the all giving horn. 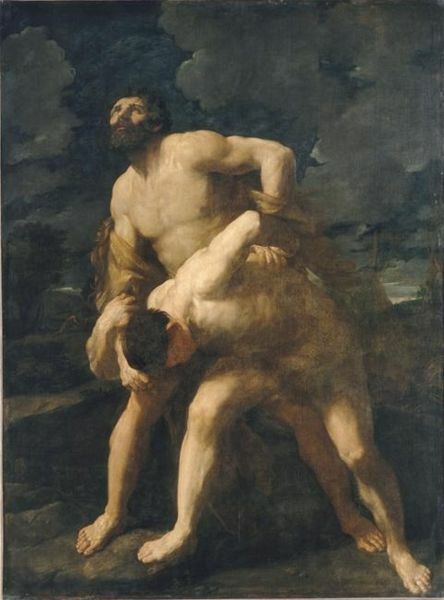 An alternate version of the fight sees Achelous exchange the Horn of Plenty, which was in his possession, with his horn now in the hands of Heracles. It might have been better for Heracles though, if the Greek hero had not won the contest, for although Deianira would become Heracles’ third wife, she would ultimately cause the demise of Heracles, when she unknowingly present her husband with a poisoned robe. 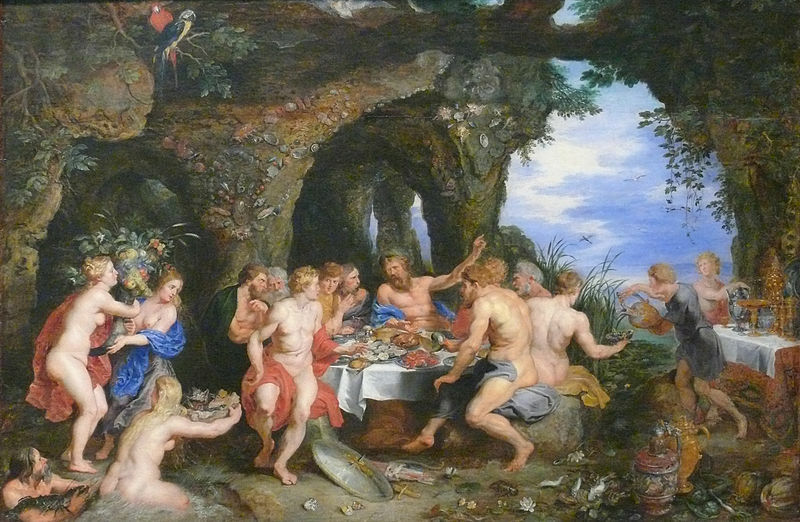 Achelous could also be hospitable though, and Theseus was said to have been welcomed by the river god, and the pair shared food, drink and stories. Also it was Achelous who purified Alcmaeon, one of the Epigoni, when the Erinyes were pursuing the hero after he had killed his treacherous mother. Achelous then gave Alcmaeon one of his daughters, Callirhoe, to be the new wife of the Epigoni, although the marriage would prove to be short-lived. Callirhoe was just one of the children of Achelous, and several water nymphs were regarded as his daughters, including the famous Naiad of the prophetic springs of Delphi. Even more famously though, Achelous was also considered to be the father of the Sirens by one of the Muses, (either Terpsichore or Melpomene). The Sirens of course were the three songstresses who lured sailors to their deaths.